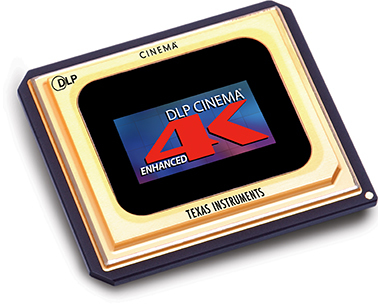 Texas Instruments’ DLP Cinema technology projects crystal clear, razor-sharp and lifelike images for the ultimate in picture quality. DLP Cinema technology delivers a true digital picture with incredible clarity and vibrant colors every show. With DLP Cinema technology, there is no more color fading, jump and weave, scratching and dirt accumulation which are common problems that plague film. DLP Cinema offers a consistent image with no degradation over time. With DLP digital, moviegoers can see a movie in its original pristine condition, exactly the way the director intended it, whether they see it during the first or fifth week of the run. Unlike other technologies, DLP Cinema offers multiple resolutions (2K and 4K) from multiple brands, Barco, Christie, and NEC. Superior choices for every theatre size. Unmatched reliability. Unmatched reliability. DLP Cinema lights up more than 45,000 screens worldwide every day with proven reliability showing after showing. The pure, reflective mirror technology of DLP Cinema delivers unparalleled brightness on the largest movie screens… up to 100 feet. Advanced 3D technology from a single projector, and a single projection lens lights up a 75 foot screen in 3D with bright, stunning clarity. For the largest screens, DLP Cinema is the technology of choice for EVERY major exhibitor deploying digital cinema. Award-winning color performance. DLP Cinema is the only imaging technology to receive an Academy Scientific and Engineering Award for precise color reproduction. Recognized for its rock-solid reliability, DLP Cinema is creating a new generation of easy-to-manage cinema projection.